I just made my third version of the Zsalya pattern from Kate and Rose. I think this is a repeat record for me -- making 3 versions of any pattern -- and each of them is quite different. 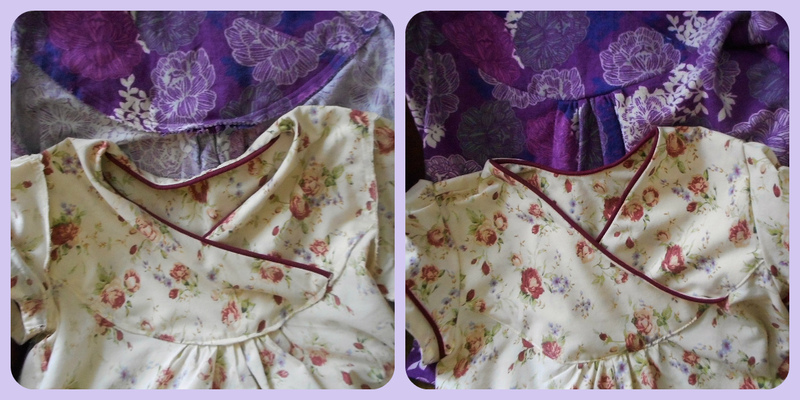 I started with a little black dress, then made a long-sleeved flannel winter version, and now have come up with a light cotton summer version. Looking a little washed out... and anxious to escape mosquitoes! I'm really pleased with how this one turned out. One of the best things about remaking a pattern is that you already have all the fitting adjustments made -- it's just lay it out and cut. Nice for a change :) I had a very subdued floral print sheet that I thought would work nicely for this pattern, and I also had some piping that matched the red tones in the print perfectly. Thus was born my summer version. I used the short sleeve option this time, and chose to use the "clean" finish for the yoke rather than the "quick and dirty" option -- both are detailed clearly in the pattern instructions and both work just fine, but on this one I thought that any extra bulk at the seams might show through the lightweight fabric, so chose the clean finish. 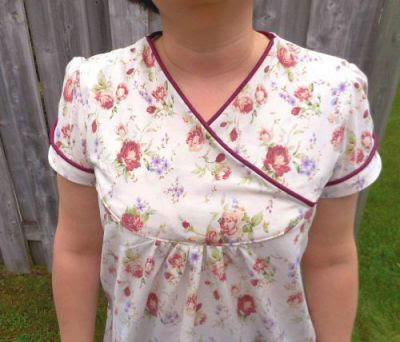 I added piping to the neckline, easy since the yoke (front and back) is fully faced. Then as I was about to add piping to the sleeves I had an idea. Instead of adding it at the sleeve edge, I added it to the facing strip, which I sewed to the inside and turned out to the outside, stitching it down along the line of piping. I really like the banded effect it's given this blouse. This is one of the three tops I made this month in an effort to use up some of my stash. I was moderately successful, considering that I still bought more fabric this month than I used. How does that happen?? In any case, I love my new Zsalya, and I'm sure it's not the last one I'll make. Easy to make and to wear, and with a pretty, folksy feel. Love it. I love all 3 of your Zsalyas but with the piping I think this is my fave! Mentally clipping that idea to my inspiration list as I've got my first Zsalya planned too. The stash always increases...incrementally and then some more:). This is a pretty top - it's great to find a pattern you like and then to use it again and again. Your dress version was lovely too. I love the sleeve detail and the soft color of the fabric set off by piping. Really pretty! Thank you! I was delighted by the exact match of red tones in both. The details on this top are great! I love a good TNT -- you can then enjoy the sewing and not worry about the fitting! That's the best thing - once you've made it (and fit it) each time it just gets faster to sew!